– Sauteed Pineapple with Teriyaki Sauce, Honey Ham, Cheddar Cheese. This one is a doozy! First you’ll be greeted by head bartender Trevor Schneider who will teach you how to make a bourbon smash with Larceny bourbon. Yes, you’ll be drinking one of them while you ask any bourbon questions you have to a representative from the Larceny distillery. Then you’ll move into The Den, Harding’s private whisky room, where you’ll experience an intimate tasting lesson with Elijah Craigh bourbon. You’ll be served a paired dish of Chef Ariel Fox’s crispy Yukon potato skins with shaved blue cheese. 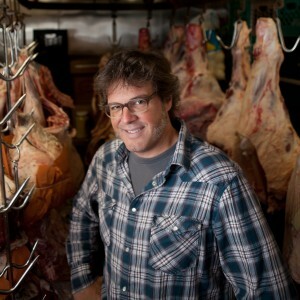 From there you’ll take a walk into Harding’s kitchen where Chef Ariel Fox will explain how they make their burger with a custom blend of 80/20 lean to fat ratio mix of chuck and skirt beef that is then mixed with a 30% ratio of short rib. The small group of you will then be seated at a community table on Harding’s VIP balcony dining table where you’ll devour said succulent Burger along with some skin-on rosemary frech fries with a paired bourbon cocktail. Due to the intensity of this event, there is a very limited amount of tickets. Sleep on this one and you’ll be sorry. To celebrate NY Burger Week & National Hamburger Month, Hudson 303 Sport Cafe’s chef has put together a SPECIAL menu of burgers, served with beer and fries. After the meal, attendees will have the opportunity to play a round on their award winning 18 hole course. – 1/3 pound of Hudson beef topped with a fried egg, homemade chili & cheddar cheese. Served on an onion roll. – 1/3 pound of Hudson beef topped with marinated & sauteed pork loin, kimchi and spicy pepper paste. Served on a brioche roll. – 1/3 pound of Hudson beef stuffed with smoked sausage, jalapeno and pepper jack topped with carmelized onions and pepper jack served with a chipotle aioli. Served on a potato roll. When Get Real Presents throws a festival there’s no playing games, unless it’s bowling! This one promises to be a rager! 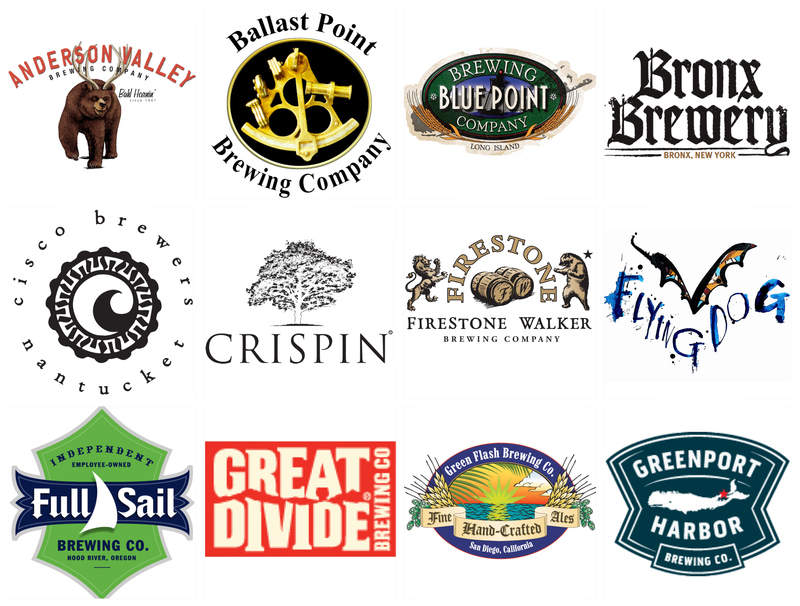 We’ve invited 24 of our favorite American craft breweries to pour some of their finest and freshest spring seasonals which you can use to wash down all the delicious food. We’ll have Pickles and Chips from our good friends at McClure’s Pickles We also welcome in Jarlsberg Cheese for a sampling of their tasty Cheeses including a specialty cheese & beer pairing. But seeing as this is NY Burger Week, we have lined up a special menu of mini-burgers made with Burger Maker’s certified humane, no antibiotics, hormones or steroids, all natural Angus beef. You know, THE GOOD STUFF. 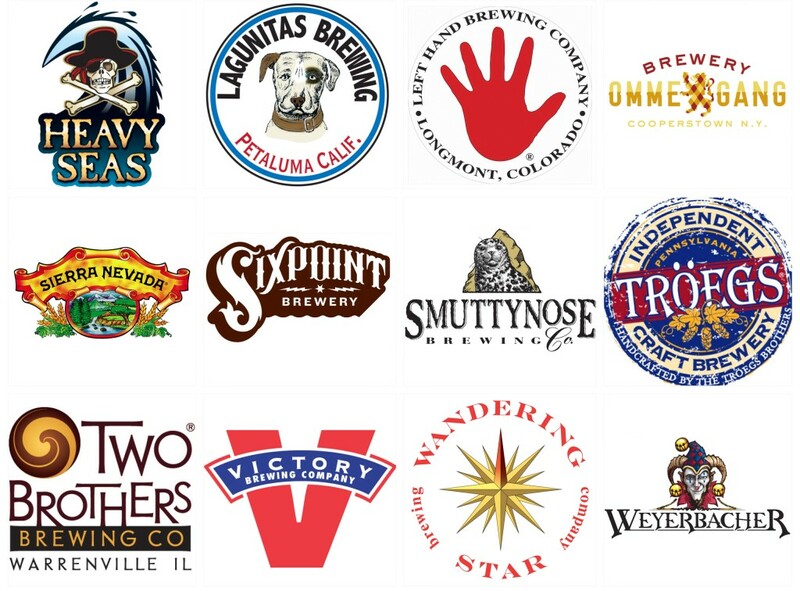 You know you can trust Get Real to bring you the best food and beer events! Grand Prize: 2 Lane Open bar party for 10 at Bowlmor, Bronx Brewery dickeys work shirt, Sierra Nevada Brewing Wall Mirror & Jarslberg Cheese Kit: Tote of Jarlsberg and Norwegian cheeses plus a cheese service board. The Off-Menu Burger Bash is NY Burger Week’s signature event and where it all started. 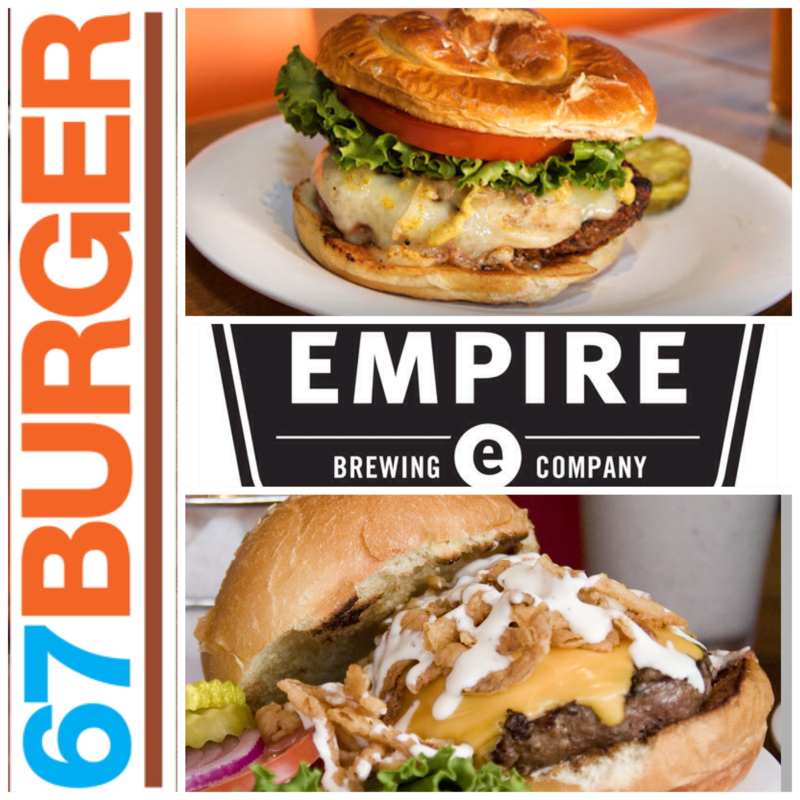 We’re extremely excited to be bringing this delicious event to 67 Burger in Park Slope. Chef Jeff promises to whip out some doosey Burgers including his famous “Pastrami Burger.” Grab a bud & join us for what will be an awesome Burger party. Wash it all down with a couple of delicious, Brooklyn made Beers from Empire Brewing Company. A representative from the brewery will be on hand to take you through a Beer tasting and answer any questions you have. 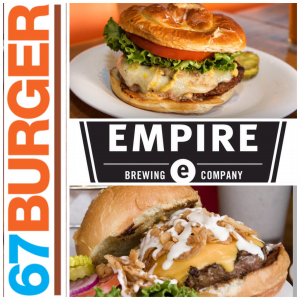 Vote for your favorite Burger at the end of the meal and whichever Burger has the most votes will become the official 67 Burger for National Hamburger Month!! Chef Jeff says: “It’s a hot mess! – Melty Jack Cheese, grilled Tomato Red Sauce, Poblano Chili dipped in a light Egg Batter and fried to a crisp! Buy a ticket to ANY 2013 NY Burger Week event and you will be entered to win a pair of tickets a private Burger & Beer Party on May 6th in Brooklyn. 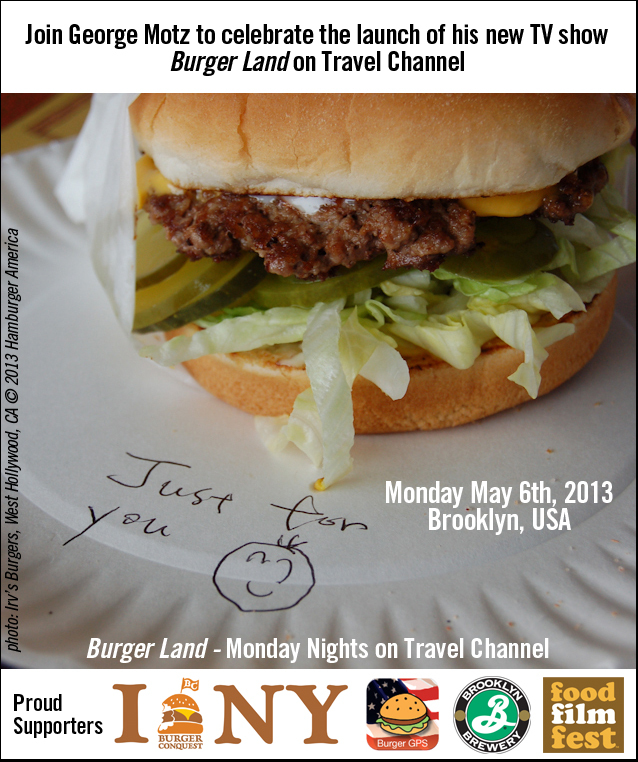 Join Travel Channel Host and Hamburger Expert George Motz to celebrate the launch of his brand new TV show, Burger Land. Presented by Burger GPS – the iPhone app that finds you a great burger anywhere in the USA. You must be 21+ years old to enter the venue. Your invite includes entry to private party, burgers and beer. Made possible with generous support from The Food Film Festival and Burger Conquest. *Winners will be chosen at random on Sunday, May 5, 2013. If you win, you will be notified by email and must reply within 24 hours to receive your passes. Sign up for the email newsletter, check out the Burger Week website and follow @BurgerConquest on Twitter for more details & event announcements. NY Burger Week is an annual delicious celebration of all things Burger in New York. It is an extension of the burger blog, BurgerConquest.com written by sales marketing strategist, David “Rev” Ciancio. Rev has written about more than 600 Burgers, been featured on 9 different TV shows and named an “Expert Burger Taster” by The Learning Channel. The Food Film Festival sprang from the imagination of Festival Director George Motz, the documentary filmmaker behind the award-winning Hamburger America film and book, along with co-creator Harry Hawk, formerly of Schnack and Water Taxi Beach. Through documentaries, features and short films, the Festival showcases the best, and the most memorable, of the world’s favorite foods. Along with a heaping helping of mouth-watering films, Motz, Hawk and company serve up the food that guests are watching on the screen for a multi-sensory, full-bodied experience. George Motz’s Official State-by-State Guide to the most interesting burgers in the USA. Author / Filmmaker George Motz has eaten over 10,000 burgers in his life. Trust him and use this app to find your next great burger. This entry was posted in National Hamburger Month, New York, New York Burger Week and tagged #NYBW, 3bs, 67 burger, alewife, amstel light, beer pairing, best burger, boozy burbs, bourbon, bowling, bowlmor, burger bash, burger conquest, burger crawl, burger gps, burger maker, burgerweek, cheese, chef ariel fox, chef dinner, ciancio, craft beer, eater, empire brewing co, french fries, get real presents, guns and roses, hamburger, hardings, hudson sport cafe 303, idle hands bar, jarlsberg, mcclures, National Hamburger Month, ny burger week, nyc, off-menu, rev, review, rockland county, that burger, the food film festival, tickets. Bookmark the permalink.